After a certain age, physical problems can prevent people from performing daily activities. Getting around becomes increasingly difficult, even when indoors. A wheelchair can help someone with mobility issues regain some of their independence, especially for doing normal activities like taking a shower and going to the toilet. It helps them to maintain their dignity. As bones become weak and joint pain becomes a reality for the aged, wheelchairs can play a useful role in helping them with their daily activities. In a comfortable chair, the elderly not only become more mobile, but they regain a sense of independence and not having to depend on anyone for simple tasks. 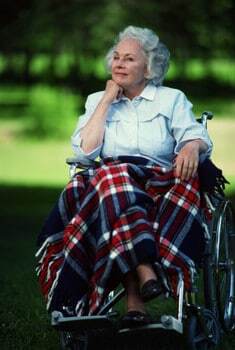 The disability of the elderly could be due to lack of energy, joint problems like arthritis or osteoporosis. Even with assistance, doing simple tasks like getting into and out of bed or just moving around becomes a very difficult task. The right wheelchair can address most of these issues and keep the user comfortable while providing mobility. The regular mobility wheelchair consists of a sturdy frame with two larger wheels that bear most of the load, two smaller supporting from wheels for stability, a seat and back of strong tough material, foot and arm rests. Two handles are at the back of the chair in the event someone needs to push the patient. The patient if capable can propel the wheelchair via the hand rim attached to the large wheels. An electric powered wheelchair might be more useful for those who are physically unable to push the regular wheelchair by themselves. Electrical wheelchair has more mobility features that the user can operate with the use of a joystick. They can move forward and backwards, turn left and right, elevate, tilt and recline. Users with limited upper body strength find these wheelchairs much easier to operate compared to the regular wheelchairs. These power chairs can now be adapted to be used in showers. Many accidents happen in the bathroom when elderly people slip on watery surfaces. Using this kind of chair can help to prevent these types of accidents and make the bathroom visit very safe encounter. These chairs can provide a sense of security, freedom, confidence and comfort for the elderly.